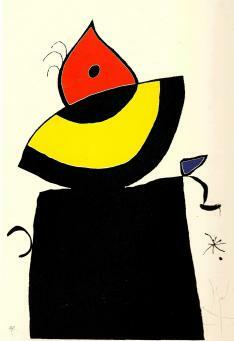 Miro was born in Barcelona in 1893 and earned international acclaim for his work in Surrealism. As a member of the Generation of '27, a collective made up of Spanish poets, writers, painters and film makers, he and others were forced to flee Spain under the Franco Regime. 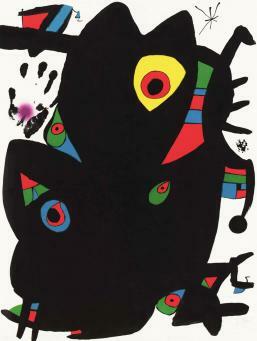 Miro's surrealist origins evolved out of 'repression' much like all Spanish surrealists whose Catalan ethnicity was subject to persecution by the Franco regime. 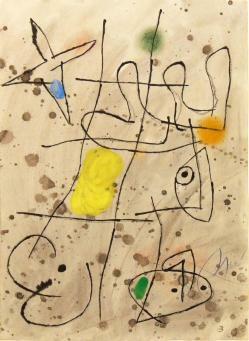 Miro was one of the first to develop automatic drawings in rejection of traditional techniques in painting. He wanted the freedom to experiment with different artistic styles and rejected membership to any artistic movement including Surrealism. Andre Breton, the founder of Surrealism, described him as "the most Surrealist of us all." Although he was living in Barcelona, Miro made frequent visits to Paris to work on printing his lithographs and engravings. In the final decades of his life, Miro worked in different media, producing hundreds of ceramics, temporary window paintings, and tapestry. 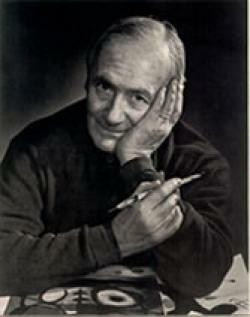 After receiving a doctorate in 1979 from the University of Barcelona, he passed away four years later in Palma, Spain. 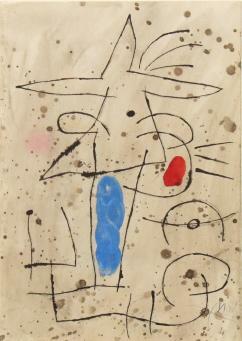 In 2008, Miro's La Caresse des etoiles sold at auction for $17m, the highest amount paid for one of his works.